The amount of 5.8 USD has been deposited to your account. Accounts: U6052112->U4836154. Memo: API Payment. Withdraw to invdefence from CoinZinc-Your Hourly Money Making Machine.. Date: 16:34 04.04.18. Batch: 210657194. The amount of 20 USD has been withdrawn from your account. Accounts: U1606***->U5569702. Memo: Shopping Cart Payment. 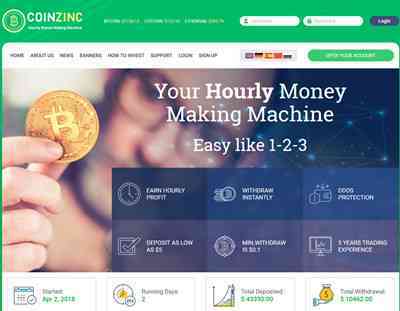 Deposit to CoinZinc-Your Hourly Money Making Machine User monihyiptop.. Date: 04:05 05.04.18. Batch: 210699731. The amount of 21.75 USD has been deposited to your account. Accounts: U6052112->U4836154. Memo: API Payment. Withdraw to invdefence from CoinZinc-Your Hourly Money Making Machine.. Date: 06:53 05.04.18. Batch: 210708581. The amount of 2 USD has been deposited to your account. Accounts: U6052112->U1606***. Memo: API Payment. Withdraw to monihyiptop from CoinZinc-Your Hourly Money Making Machine.. Date: 11:21 05.04.18. Batch: 210729876. The amount of 1.77 USD has been deposited to your account. Accounts: U6052112->U1606***. Memo: API Payment. Withdraw to monihyiptop from CoinZinc-Your Hourly Money Making Machine.. Date: 17:09 05.04.18. Batch: 210761184. Инстант 04.05.18 11:40	Account	Receive	+2.17	Received Payment 2.17 USD from account U6052112 to account Batch: 210731614. Memo: API Payment. Withdraw to Irina22 from CoinZinc-Your Hourly Money Making Machine. Инстант 04.06.18 04:22	Account	Receive	+6.53	Received Payment 6.53 USD from account U6052112 to accountBatch: 210795459. Memo: API Payment. Withdraw to Irina22 from CoinZinc-Your Hourly Money Making Machine. The amount of 3.48 USD has been deposited to your account. Accounts: U6052112->U1606***. Memo: API Payment. Withdraw to monihyiptop from CoinZinc-Your Hourly Money Making Machine.. Date: 16:49 06.04.18. Batch: 210847989. Инстант 04.06.18 12:14	Account	Receive	+5.8	Received Payment 5.8 USD from account U6052112 to account Batch: 210826255. Memo: API Payment. Withdraw to Irina22 from CoinZinc-Your Hourly Money Making Machine. The amount of 3.48 USD has been deposited to your account. Accounts: U6052112->U1606***. Memo: API Payment. Withdraw to monihyiptop from CoinZinc-Your Hourly Money Making Machine.. Date: 04:53 07.04.18. Batch: 210880579. Инстант 04.06.18 20:04	Account	Receive	+5.8	Received Payment 5.8 USD from account U6052112 to account Batch: 210863043. Memo: API Payment. Withdraw to Irina22 from CoinZinc-Your Hourly Money Making Machine.